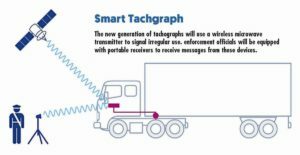 German manufacturer Continental has received the first interoperability certificate for a smart digital tachograph. Germany type approved the model just before Christmas. This important step makes equipment available for fitting to coaches that will be put on the road after 15 June this year, the introduction date for mandatory fitment of smart tachos on new vehicles. It also opens up options for operators who want to retrofit their fleets as soon as possible. Continental launched its smart tachograph, VDO DTCO 4.0, at the IAA show in Hanover last year. Other manufacturers are expected to bring forward their own offerings in the coming months, and a more settled market will follow when all the models are proved to be interoperable. Smart tachographs defeat a number of vulnerabilities which can allow drivers to cheat driving hours, and offer additional enforcement information ‘live’ over a short-range microwave transmitter which can be used to remotely – in roadside stops, for example – interrogate the tacho for infringements. It can double as a toll transmitter which will work with European smart tolling systems, now being installed.